L.A. MALDONADO was born and raised in Pompano Beach, Florida. At the age of 17, he moved to West Texas for the next 16 years. In 2010 he thought it would be a good idea to head back to his roots in home state. Maldonado now lives in Lehigh Acres, Florida, with his small family and two dogs, Esme and Sammy. He's a fan of most things geeky (think: Buffy The Vampire Slayer, Charmed, Once Upon A Time, The Walking Dead, all kind of books like Beautiful Creatures, The Vampire Chronicles, Twilight Saga, The Hunger Games, Fear Street, Harry Potter...). He has been in love with books since he was given his first novel on his 8th birthday called "I Know What You Did Last Summer" by Lois Duncan, way before Hollywood ever thought of making a Blockbuster movie out of it. Everyone who knew him in school says that he is caring, giving, and the brave one out of the group of friends. Every time you see Maldonado, he always has a book in his hand reading. While he was in high school he wrote poems and short stories and had a number of them published in the school newspaper. Unhappy about moving away from her city home and friends in Gabbie and the Secret Door by L.A. Maldonado, Gabbie is pleasantly surprised when she discovers an amazing secret hidden in the wall of her new bedroom. In a suburban neighborhood where she has to stay in the house, Gabbie takes refuge sneaking through the hidden door into an exciting land of unicorns and magic. Captured by goblins called dakhunas, Gabbie is afraid that she will never see her parents again. Fortunately she is rescued and taken to a village where the leader gives Gabbie an amulet that allows her to understand other languages. When Gabbie discovers that an evil queen is killing the unicorns, she does everything she can to help the tribal people protect them. Gabbie’s adventure takes her home again but she is determined to help the forest people and save the unicorns. Will she be able to escape the evil queen and trick her into an ambush so the warriors can defeat her? Is she, in fact, the warrior spoken of in the old prophecies? 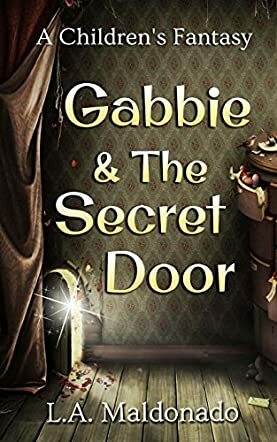 Gabbie and the Secret Door by L.A. Maldonado portrays many of the insecurities children experience when they have to move away from comfortable, familiar surroundings. Gabbie’s adventure demonstrates the inner strength she possesses in spite of her fears, and highlights the goodness of her character. With a subtle caution about protecting the earth and sharing resources, the message Gabbie sends is for people to work together to take responsibility for maintaining peace and protecting Mother Earth. This is an enjoyable story that lets the imagination explore new and exciting worlds and shows that good can triumph over evil.